In grade school, I was never one to resist the advice of a teacher. So, when told that successful study habits included taking notes, underlining, and starring right in the book itself, that is precisely what I did. Those teachers were right, of course, and I find myself often repeating the same advice to my own students despite their frequent resistance to marring the pristine pages of their soon to be resold copies of Beowulf and Sir Gawain and the Green Knight. What I did not know in grade school, however, was that writing in my books meant participating in an ancient tradition of responding to and even interpreting texts, and that one day I would write an entire dissertation about how medieval readers read by studying the evidence left behind by the medieval and early modern readers of a famously unstable text called Piers Plowman by William Langland. The truth is that people have pretty much always written in their books and, sometimes, books belonging to others as well—rubricating, annotating, bracketing, scribbling, doodling, and more. Whether those readers responded in sparse intervals, limiting their voice on the page to vague marks, or, in contrast, wrote intensely, vociferously inscribing their presence irrevocably onto the page and into the text itself, these voices often remain the best extant evidence available for scholars attempting to understand the reception history of an author whose earliest readers have long since passed. 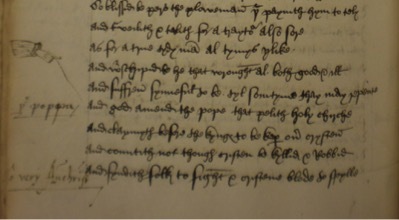 One example of a vocal, reform-minded reader can be found in an early modern household manuscript copied by Sir Adrian Fortescue, a distant relative of Anne Boleyn executed by Henry VIII for some unknown act of treason. 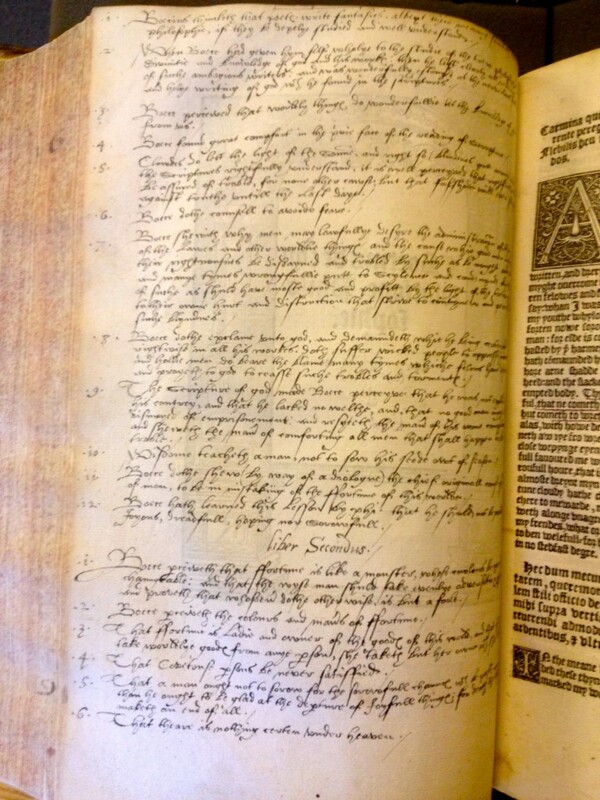 His manuscript, Oxford, Bodleian Library MS Digby 145, contains a personalized, conflated copy of what we now call the A and C versions of Piers Plowman alongside a political treatise written by Adrian’s uncle, John Fortescue, called The Governance of England. Filled with annotations in the hands of at least three readers, this book documents a series of responses made over time by Adrian, his wife Anne (who signs her name in Latin! ), and the unknown Hand B. The conversations among these readers make this record of reader responses particularly special, but it is Hand B, the subject of this post, that becomes the most reactionary to some of Langland’s biting criticisms of the Church. Oxford, Bodleian Library MS Digby 145, fol. 121v. By permission of the Bodleian Libraries, University of Oxford. ô very Antechrist And fyndith folk to fight & cristene blode to spylle. The annotation, “O Very Antichrist,” transforms Langland’s corrupt pope into the face of the Apocalypse itself, an even more extreme condemnation of immoral papal behavior than Langland’s. This annotation also lays the groundwork for his second conflation in which he identifies Langland’s Antichrist as the pope, writing “puppa [sic]” next to the line, “And a fals fend antecriste ouer al folke reynyd.” Here Hand B reads the Antichrist’s extensive and increasing worldly authority as the same as that belonging to the pope. In both instances, the annotator melds the Antichrist and pope, two separate entities in the poem, into a single figure responsible for an eschatological catastrophe. In some ways, Hand B’s sixteenth-century reactions to this medieval poem make sense amidst a backdrop of increasing religious instability in Henry VIII’s England. Perhaps Hand B saw in the unstable papal seat produced by the Schism a parallel with the splintering of religious power between Rome and Henry leading up to and during the English Reformation. Beyond these historical inferences, however, what exactly do Hand B’s strong, reform-minded reader responses teach us about the identity of this reader and his interpretation of the poem? In fact, it tells us both a lot and not very much at all. He clearly disagrees with the ecclesiastical corruption that he sees as trickling down from the Church’s highest seat of power, and he reacts strongly, even emotionally, as he inscribes his interpretive voice onto the page. Piers Plowman’s ending evokes a passionate, rather than objective, response from this reader, who adds his own polemical lament to Langland’s verse. This reader provides just one example of the strong personal investment that Langland’s early audiences felt when reading Piers. He also demonstrates how reading and interpreting literature can aid in the formation and circulation of reformist ideas, especially in precarious times. However, to what end Hand B voices his cry for reform remains unclear. Without knowing his identity, his exact purpose is impossible to discern because he could be either a Catholic hoping for ecclesiastical reform or a Reformation era Protestant. Adrian’s manuscript stayed in his family until Bodley eventually bought it, increasing the likelihood that Hand B was a family member, or at least a close affiliate. Moreover, the Fortescues maintained their Catholic identity throughout the period, but that does not mean that every single member of the family necessarily adopted the exact same religious practices and beliefs. Without word choices that obviously indicate one camp or the other, the greater social implications of Hand B’s readerly perspectives lead to fuzzy conclusions at best. The enigma of whether he desires institutional change or seeks an altogether new institution of faith must by necessity remain unsolved, at least for now. For this reason, scholars must, with care, entertain multiple possibilities, sometimes foregoing exactness and precision when faced with limited evidence for a text’s reception history. Hand B actually teaches us a great deal more about his reading of Piers than many other annotators, but, as is the case with so many historical records of literary readership, his reader responses still require a certain level of imprecise, imperfect, and even incomplete interpretation. For Adrian’s biography, see Richard Rex, “Blessed Adrian Fortescue: A Martyr without a Cause?,” Analecta Bollandiana 115 (1997): 307-53. On Anne Fortescue, see Kathryn Kerby-Fulton, “The Women Readers in Langland’s Earliest Audience: Some Codicological Evidence,” in Learning and Literacy in Medieval England and Abroad, ed. Sarah Rees-Jones (Turnhout: Brepols, 2002), 121-34. On the identification of Hand B, see Thorlac Turville-Petre, “Sir Adrian Fortescue and His Copy of Piers Plowman,” Yearbook of Langland Studies 14 (2000): 29-48. For my full analysis of these readers’ annotations, see Karrie Fuller, “Langland in the Early Modern Household: Piers Plowman in Oxford, Bodleian Library MS Digby 145, and Its Scribe-Annotator Dialogues,” in New Directions in Medieval Manuscript Studies and Reading Practices: Essays in Honor of Derek Pearsall, eds. Kathryn Kerby-Fulton, John J. Thompson, and Sarah Baechle (Notre Dame: University of Notre Dame Press, 2014), 324-341. Transcription mine, fol. 121v. The equivalent lines appear in C.XXI.446-449 in A.V.C. Schmidt, Piers Plowman: A Parallel-Text Edition of the A, B, C, and Z Versions, 2nd ed., 2 vols. (Kalamazoo: MI: Medieval Institute Publications, 2011). Transcription mine, fol. 124r; C.22.64 in Schmidt. 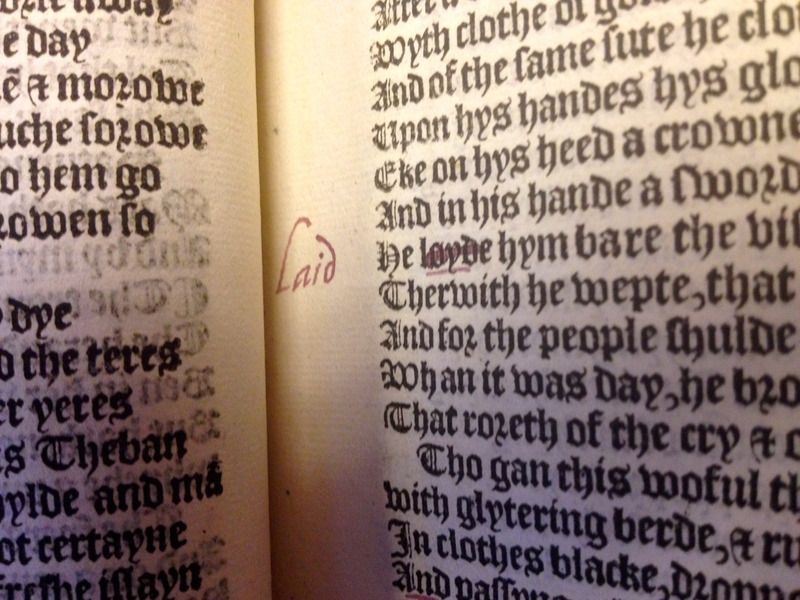 For another example, see Kathryn Kerby-Fulton’s transcription and discussion of the annotations in Bodleian Library MS Douce 104 in Iconography and the Professional Reader: The Politics of Book Production in the Douce “Piers Plowman” (Minneapolis: University of Minnesota Press, 1999). Examples of more terse annotations, which tend to be more characteristic of B-text manuscripts, can be found in David Benson and Lynne Blanchfield, The Manuscripts of Piers Plowman: The B-Version (Woodbridge: D.S. Brewer, 1997). When looking at medieval manuscripts for the first time, one might notice smaller words inserted between the lines of the primary text. Called interlinear glosses, this type of addition can be divided into two kinds: lexical and suppletive. The former typically provides explanations of difficult vocabulary, while the latter might explain a point of grammar. Unsurprisingly, they were useful for students who were learning Latin [i], as glosses might explain a challenging turn of phrase or a grammatical sticking point. Although many were added in Latin, they might be written in any number of other languages. The Lindisfarne Gospels, a famous manuscript from the early 8th century, has Old English glosses added by Aldred, provost of Chester-le-Street in the 10th century. While interlinear glosses can provide information about the language mechanics of the primary text, they can also direct the reader’s attention and shape comprehension of the selection at hand. The introduction of definitions and sentence scaffolding can alter the reader’s experience, potentially producing a new understanding of the central text. Glosses, as opposed to some instances of impulsive marginalia, were rarely spontaneous [ii], but were typically added to a volume and included in subsequent copies. On some occasions, the scribe copying the manuscript might mistake an interlinear gloss for part of the main text and reproduce it in the body of a new document [iii], an error which can even survive into subsequent translations [iv]. In addition to interlinear glosses, a text might share the page with a commentary, granting the reader access to critical interpretation as they progress. Commentaries were not limited by genre and could be composed for many different types of texts, from poetry to theology. Although early manuscripts may have been more simply formatted, by the Carolingian period, the page was being fashioned with one column for the primary text and a second for the commentary [v]. The side-by-side layout allowed readers to shift back and forth between the base text and the critical interpretation without having to retrieve other books (which may not have been readily available). 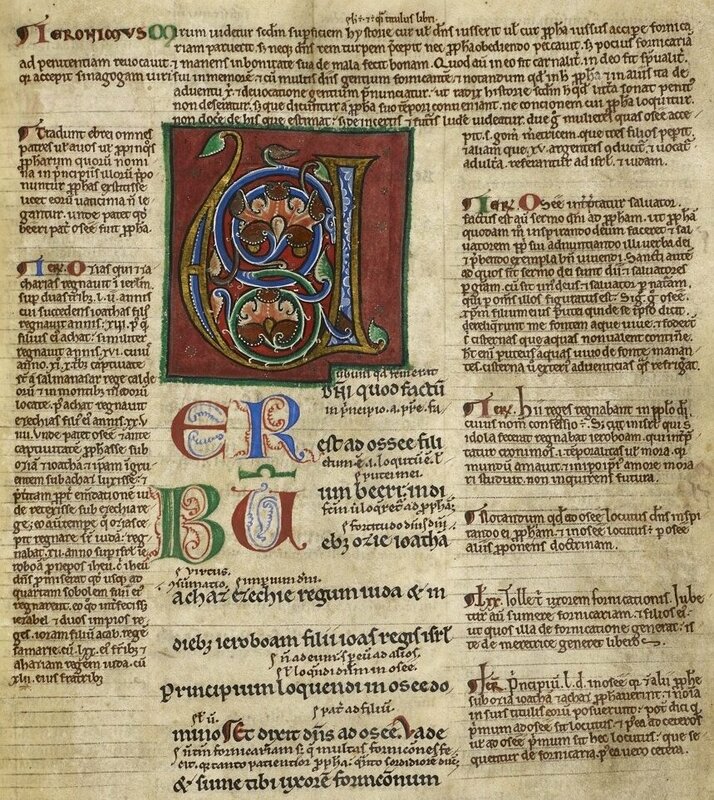 By the twelfth century, the Glossa ordinaria by Nicholas of Lyra, which features an even further integrated format [vi], was becoming the authoritative biblical commentary [vii]. For the 21st century reader, the sheer amount of text might seem overwhelming at first, but following the hierarchy of scripts, one can sort out the interlinear glosses and commentary from the foundation text. In the example above from BL Harley MS 1700, the reader can start with the largest letter: an illuminated “U”. This introduces Uerbum (“word”) which becomes the first word of the verse and forms the beginning of the biblical passage. The widely spaced text allows the interlinear gloss to be written between the lines in a smaller hand. The large text blocks around the central section form the commentary and provide a close reading of the biblical text, proceeding line by line and word by word. [i] F. A. C. Mantello and Arthur George Rigg. Medieval Latin: an Introduction and Bibliographical Guide. (Washington DC: The Catholic University of America Press,1999), 95. [ii] Raymond Clemens and Timothy Graham, Introduction to Manuscript Studies (Ithaca: Cornell University Press, 2007), 39. [iv] Ralph Hanna, Tony Hunt, R.G. Keightley, Alastair Minnis, and Nigel Palmer, “Latin commentary tradition and vernacular literature” in The Cambridge History of Literary Criticism Vol. 2, Vol. 2. (Cambridge: Cambridge Univ. Press, 2005), 364. [v] Bernhard Bischoff, Latin Paleography: Antiquity and the Middle Ages. (Cambridge [England]: Cambridge University Press, 1990). 28. [vii] Rafey Habib. A History of Literary Criticism and Theory: From Plato to the Present. (Malden, Mass: Blackwell Pub, 2008), 176. [viii] Alastair Minnis. 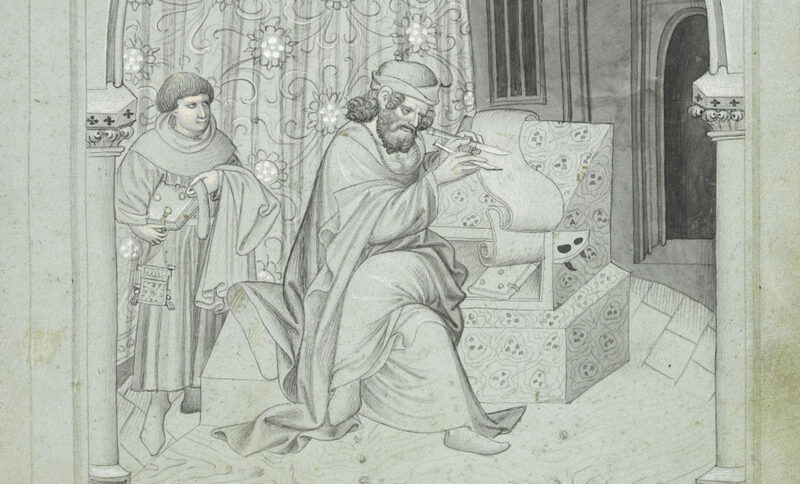 Medieval theory of authorship: scholastic literary attitudes in the later Middle Ages. (London: Scolar Press, 1987), xxix. Last week, I surveyed Chaucer’s representations of prison spaces throughout his corpus. Today, I consider one reader of Chaucer, for whom those images of imprisonment would have particularly resonated. In January of 1549, John Harington of Stepney and Kelston was arrested and sent to the Tower of London. Harington remained in the Tower with his master, Thomas Seymour (the brother of Henry VIII’s third wife, Jane) for more than a year. What was a literary-minded gentleman/prisoner to do with all of that time? Harington may have read Chaucer. Harington was in the Tower following suspicion about the nature of Seymour’s relationship with the very young Princess Elizabeth. He was also questioned regarding his own role in setting up a marriage between Lady Jane Grey, the nine-days queen, and the young King Edward VI. Though the 1550 date on the front of Harington’s copy of Chaucer is not definitive evidence that he held the book while he was in the Tower, the long and idle days of imprisonment would haven given Harington the time he needed to thoroughly annotate his copy of William Thynne’s 1542 edition of Chaucer’s complete works. Harington’s copy is now housed at the University of Notre Dame’s Hesburgh Library. 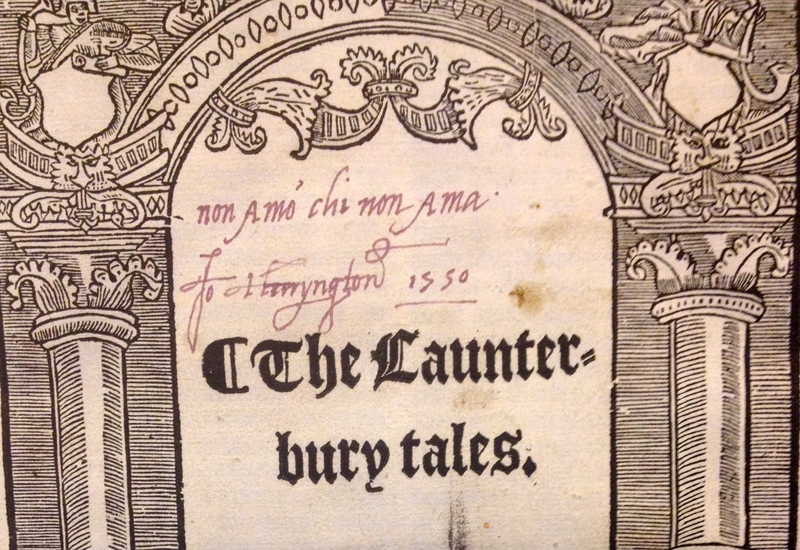 John Harington’s dated signature on the opening plate of William Thynne’s 1542 edition of Chaucer’s complete works. The inscription reads “non Amo’ chi non Ama.” University of Notre Dame, Hesburgh Library, XLarge PR 1850 1542. 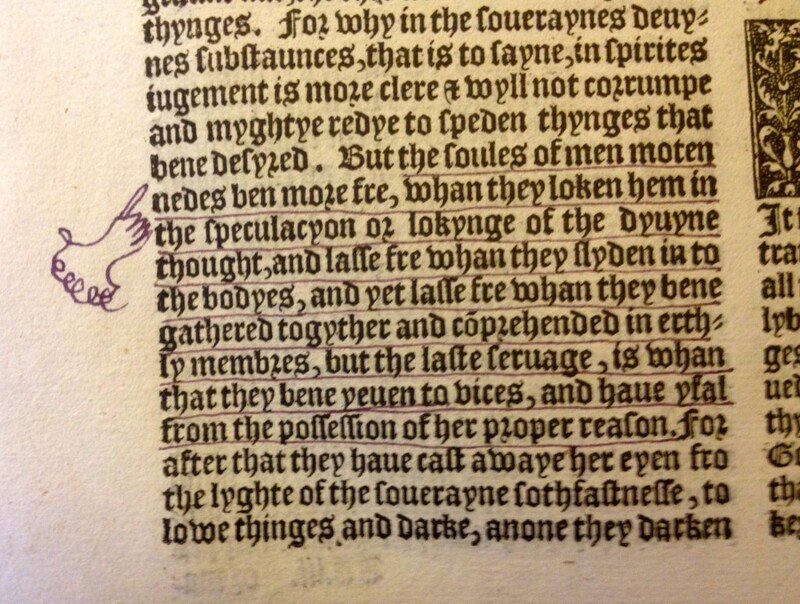 Nearly every page of the 1542 book shows evidence of Harington’s attentive reading. This post, of course, cannot cover everything involved in Harington’s copious marginal writing, but if readers are interested, they can consult my more detailed article — “Reading Chaucer in the Tower: The Person Behind the Pen in an Early-Modern Copy of Chaucer’s Works” — forthcoming in The Journal of the Early Book Society, volume 18. One of Harington’s key concerns throughout was correcting ‘errors’ where he saw them in his book. He ‘corrects,’ or modernizes, spelling and adds commas or other marks of punctuation where he finds them appropriate. Though these meticulous changes may make Harington seem a bit finicky, they reveal how closely he paid attention to every word on the page. He desired to improve his book, certainly an indication that he valued Chaucer. However, his annotations are much more extensive than simple summary notes and spelling changes. Of particular interest to Harington was Chaucer’s Boece, a translation of Boethius’s Consolation of Philosophy. A full-page table of contents and summary precedes Boece on a blank verso page, and Harington marginally marks the translation throughout. That Boethius wrote the Consolation of Philosophy while in prison might have resonated with the imprisoned Harington. The imprisoned gentleman may have found Boethius’s discussions of free will, predestination, and changeable fortunes particularly relevant as he lamented the downturn of his own fortunes in court. Certainly this was the case for the imprisoned King James I of Scotland when he wrote his prison poem The Kingis Quair, which drew on Boethius. Overall, Harington, who also occasionally wrote his own poetry, was an attentive reader, finding solace in careful study. He was meticulous, academic, and thorough in his annotations, but, it would seem, he was also attentive to the book’s correspondences with his own life and experience. 1. Ruth Willard Hughey, John Harington of Stepney: Tudor gentleman (Columbus, OH: Ohio State UP, 1971), 28. 5. John Harington, “The booke of freendeship of Marcus Tullie Cicero,” in Hughey, John Harington, 137. 6. Geoffrey Chaucer, The Workes, Newlye Printed: Wyth Dyuers Workes Whych Were Neuer in Print Before, ed. William Thynne (London, 1542).